Music Education outside of the classroom is nothing new, of course, and even the concept of franchised programs isn’t a breakthrough. However, in the past few years, performance-based music instruction organizations have been making a greater impact- due partly to cutbacks in traditional school music programs, perhaps, as well as these alternate programs’ embrace of more contemporary styles of music. MMR recently spoke with the higher-ups from some of the largest and most well known music education franchises to get the inside track on this current trend. 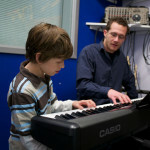 Brian Gross: Our philosophy since day one has been that students learn best when playing the music they love most. Our vision was to transform music instruction into a team sport by coupling rigorous individual instruction with band practice that keeps students motivated by playing in a group. We believe that part of Bach to Rock’s success can be attributed to interest in music education at an all-time high, especially with the popularity of American Idol, X Factor, The Voice and Glee. Additionally, music instrument ownership is up nearly 10 percent in the U.S. according to NAMM. With music and arts programs continuing to be cut due to diminishing school budgets, Bach to Rock helps meet the increased need for high-quality music education. MMR: Can you describe your relationship with area music instrument retailers and suppliers? BG: At Bach to Rock, we have partnerships with local, regional, and national retailers,. We work with partners ranging from Casio, Music & Arts, and D’Addario to local music stores that offer sheet music and instrument rentals. While we have some national partnerships, we also encourage all our local schools to develop partnerships with the retailers in their area. In the end, we don’t want to be a retail outlet. We don’t want to sell or rent instruments. We’ll sell some consumables, like picks and drum sticks, but small, minor items. For everything else, we’re looking to develop symbiotic relationships where we can refer people to MI retailers, so our customers can get quality products and services and customer service. In return, hopefully, they’ll refer us for lessons and when people are looking for performance opportunities. Our schools should be a focal point within the community when it comes to music, music education, and serving the community. What I mean by that is, for example, one of our schools works with a local recreational council and provides a PA system for the local sports leagues. In return, our kids perform every Saturday morning before and after the baseball or soccer games. It’s about being ingrained in the community, not only for our business success but also just to be a good community citizen. MMR: Do you have any data as to the advancement of your participants and graduates? How many “stick with it,” as it were? BG: Last year we experienced a 9.2 percent jump in revenue, as student enrollment and interest from new franchisees reached an all-time high. We also saw an incredible 24 percent jump in summer camp attendance. This demonstrates that Bach to Rock has a strong business model. Our students progress faster and gain an early sense of accomplishment because they get to play the music they love most. We create custom music arrangements based on instrument, skill level, and preferred music genre so that they can experience success early on. This encourages students to “stick with it.” Furthermore, we create numerous opportunities for students to showcase their talent within the community. The praise they receive through performing builds confidence and self-esteem, keeping students motivated to continue taking lessons and playing with their bands. Lastly, our progressive curriculum is constantly evolving to keep students motivated and engaged. Students can choose from a large variety of instruments from drums, guitar, piano and voice to cello, trumpet, violin, clarinet, and flute. MMR: How would interested parties go about franchising with your organization? BG: This year, we’re focusing on expanding our footprint to major metropolitan areas across the country and we are currently seeking qualified franchise candidates with strong management or business backgrounds. This is an opportunity for entrepreneurs to build a business that is dedicated to helping children and adults learn to play the music they love. While music experience or ability is not necessary, candidates should be able to build a strong team of committed musicians to ensure the school’s success. To learn more about ownership opportunities with Bach to Rock, as well as our veteran and franchise referral programs, contact Ralph Rillon, vice president of franchise development, at (855) B2R-7570 and franchise@b2rmusic.com. MMR: Any plans for the coming months that you want to share? 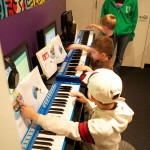 BG: Bach to Rock opened its first corporate-owned location in Bethesda, Md. in 2007 and, since, has grown to six corporate schools: two in Maryland and four in Virginia. There are also three franchisee-owned schools on their way – Port Washington, N.Y. and Wayne, Pa. (slated to open this summer) and Sacramento, Calif. slated to open this winter. 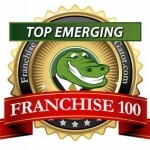 We expect to continue the rapid growth of our franchise network. Within the next five years, we expect to have 75 to 100 Bach to Rock schools across the country. As we look further out onto the horizon, we envision 400 to 500 Bach to Rock schools in the U.S. alone. But the beautiful thing about music is that it’s a universal language. We could just as easily open a Bach to Rock in Europe as we could in Asia as we could in the Middle East. 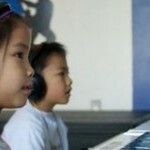 Ultimately, we envision Bach to Rock as a global brand that has schools across the world. Additionally, we expect our product to continue to expand. We are piloting a DJ school in two of our locations, which has shown a high level of promise. We also recently launched a new infant and toddler music class called “Rock n Roll” in our Maryland and Virginia schools that is designed to help young children experience musical concepts through fun and interactive games together with their parents.